This 6 oz. (170 gr.) machine features a spun aluminum kettle for fast warm up and consecutive three-minute popping cycle. 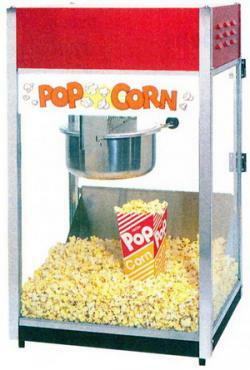 Features heavy-duty kettle drive motor, tempered glass, strip heat corn freshener under the deck of the popper. W46xD41xH71 cm. ; 230 V, 50 Hz; 1220 W; ship. wt. 25 kg.